By admin , in Neck and Shoulder Reasons of Back Pain on April 8, 2019 . If you suffer from shoulder and neck pain, it is highly possible that the rotator cuff is the source of your problem. According to the American Academy of Orthopaedic Surgeons, around two million people in the U.S. went to their doctors in 2018 because of a rotator cuff problem. 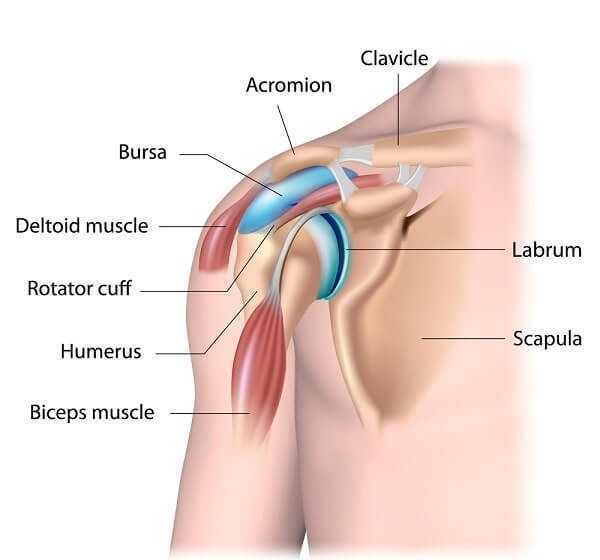 The rotator cuff is a complex arrangement of muscles and tendons that keeps the head of the upper arm bone (humerus) in place in the shoulder socket. This structure makes the shoulder joint both mobile and strong. Two fluid-filled sacs (bursae) smooth the movement between bones, muscles, and tendons and protect the rotator cuff from the bony arch of the shoulder blade (acromium). The most common rotator cuff problems are tendinitis—inflammation of a tendon—and bursitis— inflammation of the bursal sacs that protect the shoulder. The two often go together. The supraspinatus muscle, the part of the rotator cuff closest to the top of the shoulder blade, is easily strained by unaccustomed frequent or repetitive actions (for example, painting a ceiling or pitching a baseball) or a sudden wrench or a blow. If this happens, the tendon becomes inflamed and thickened—a condition called supraspinatus tendinitis. The muscle is then liable to be chafed by nearby bones and ligaments, causing further inflammation and soreness. This additional challenge is called impingement syndrome. 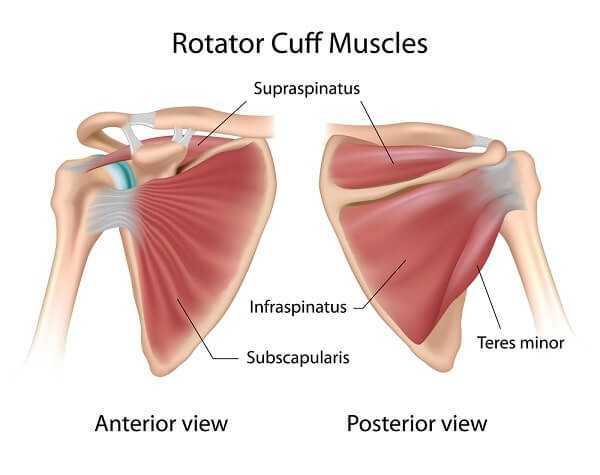 2 What causes rotator cuff problems? Once a rotator cuff problem has set in, any activity that involves lifting your arm, like getting dressed or reaching for something, can result in a shooting pain. When the rotator cuff muscles cannot move easily, those between the neck and the shoulder tend to overwork to compensate, leading to hunched shoulders. The area often feels tender. Lying on that side is painful and this may interfere with sleep at night. Supra Test Try this easy test to tell if you have supraspinatus tendinitis. Start with your arm at your side. Then gradually raise it directly out from the side, palm down. If you feel pain between 60 and 120 degrees from the vertical, the supraspinatus tendon is likely to be inflamed. If you repeat the maneuver, palm up, there will not be any pain unless the condition is advanced, as the tendon does not now slide over the upper tip of the shoulder blade. What causes rotator cuff problems? This part of your body becomes more vulnerable to injury as you age. Damage happens in various ways: from sudden trauma like a fall or accident (typically when you put your arm out to save yourself from a fall), from continuous overuse during sports or work, or from gradual deterioration of the muscles and tendons due to aging. If untreated, inflammation and impingement can eventually lead to weakness and a tear in the rotator cuff tendons. A tear can also happen suddenly, due to trauma. This sounds pretty serious, but you may not even realize that your rotator cuff is torn, though sometimes the injury can cause significant pain and need treatment. After listening to an account of your symptoms, your physician may need only to make a physical examination in order to reach a diagnosis of a rotator cuff problem. How freely and painlessly you can move your shoulder and arm will give pointers to where the problem lies. If your doctor suspects impingement, he or she may inject a small amount of anesthetic into the space under the upper part of the shoulder blade to see whether that relieves the pain and restores some mobility. 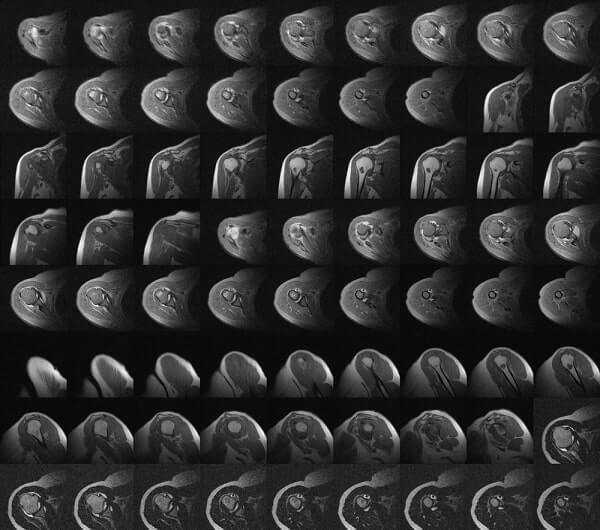 As it can be hard to tell by examination whether there is a tear in the rotator cuff, you may be sent for further tests, such as an MRI scan. If you have tendinitis or a tear, your physician is likely to recommend that you take steps to alleviate the pain and inflammation with rest, an ice pack or heat pad, and antiinflammatory medication . Referral to a physical therapist for passive exercises (in which the therapist gently extends the range of movement of the joint) is usually the next step. In addition, ultrasound may be used as a treatment to reduce inflammation of the soft tissues and improve blood flow. Massage therapy may also be advised. Later, your physical therapist may recommend further gentle stretching and strengthening exercises. CAN YOU DO THIS? Check out the flexibility of your rotator cuff muscles and tendons by trying this simple move. If you can’t reach, regular practice may increase flexibility. If none of this works, a corticosteroid injection into or near the painful spot can bring relief. For those who have been in serious pain for many months, surgery may be an option. This may involve removing some bone or part of the bursa to relieve pressure in the area. If there is a muscle tear, the surgeon may also carry out a repair. A carefully planned rehabilitation program under the supervision of a physical therapist is essential after shoulder surgery.